Since I was 17 years old, studying the Bible has been my passion. Now as a Catholic it has increased 100%. Back in my youth, I could never have anticipated the wealth of materials for study that I now have at my fingertips. FIRST, Catholic Scripture Study International. I have written many of the studies for this program and I highly recommend it. Use it for a group study, family study or individual study. It has everything you need in the box — all you need to do is add water :-) But really, it can be used by and veteran student of Scripture or by a complete novice. SECOND, I recommend Verbum Catholic and Bible Study Software. This works on all computers and sync’s with tablets, smart phones or any other device. 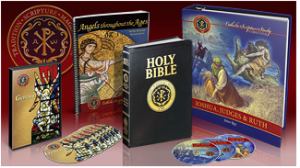 Take a whole Catholic library with you wherever you go. It is an incredible resource which I have used since 1990. Enter STEVERAY10 in the Promo Code for 10% discount. Make new resolutions to study God’s word this next year, or give someone else the gift of Bible Study. STEVE RAY HERE: Your question is unclear but the Revised Standard Version Catholic Edition is a good one. Hi Steve! I just got the free app for the Verbum Catholic Bible Study. In the included library is the “Treasury of Scripture Knowledge.” It has many helpful cross references, though still somewhat challenging to use in finding answers to difficult questions about the Faith. I actually forgot to ask the question in my last comment, but is this book, “Treasury of Scripture Knowledge,” a good resource to use? STEVE RAY JERE: Yes, very good. Next post: Was Jesus Born on December 25?